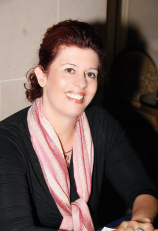 Rania Skordili is the Marketing Director of Info Quest Technologies. She joined Info Quest Technologies in 2000, having in total more than 20 years' experience in Marketing & Marketing Communications Departments of ICT companies. During her career she has being involved as a team member or project leader in the successful launching of many new exciting products, technologies and services in the Greek Market. She holds a Bachelor Degree in Physics, from the University of Athens and an MSc in Information Science from City University, London, UK.